Larson’s latest book, All Summer Long. 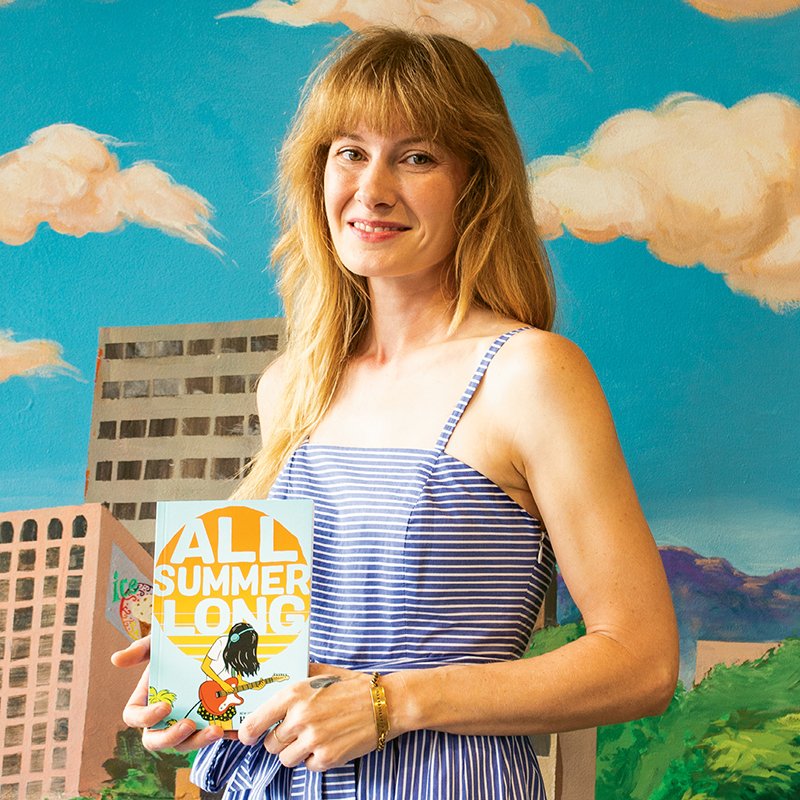 Larson’s latest book, All Summer Long, which she both wrote and illustrated, was published in May and delves into the transitory uncertainty of youth. Through her published works, including the coming-of-age tale in Chiggers, Larson has amassed a fan base, which she interacts with through book signings. In 2012, Larson won her second Eisner Award, the Oscars of the comic book world, for her adaptation of the literary classic A Wrinkle in Time. In 2016, Larson began writing the monthly Batgirl series for comic giant DC Comics. Larson often uses fantastical elements, such as nineteenth-century pirate adventures, to examine issues like identity, autonomy, and family ties. With elfin features and an almost mischievous, easy smile, Hope Larson looks like she could be the spunky heroine of a comic book, so it’s not surprising that she writes and illustrates graphic novels for children and young adults. Her original novels, including her just-published All Summer Long, as well as her adaptations of iconic stories, like Madeleine L’Engle’s A Wrinkle in Time, have solidified her reputation as one of the premier graphic novelists for younger generations. Her work has earned Larson adoring fans, not only with younger readers, but also among critics and connoisseurs, who have lauded her efforts with honors like the Will Eisner Comic Industry Award, which she received in 2007 and 2012. Larson moved to Asheville as a baby and recalls making up stories and drawing from an early age. “I remember dictating stories to my dad to write down before I actually knew how to write, and I would illustrate them,” she says. An avid reader, she particularly enjoyed fantasy works like L’Engle’s novel, which she adapted in 2012. While attending high school at Asheville’s Carolina Day School, a breakthrough manga series (a Japanese style of comics) called Ranma 1/2 was passed around by friends, and Larson was hooked. After graduating, Larson went to Rochester Institute of Technology. She planned to study film, but the comics she created for friends eventually drew the attention of Scott McCloud, author of Understanding Comics, who encouraged her to pursue the form. She later transferred to the Art Institute of Chicago to study fine art, and a piece of hers was published in the 2005 anthology Flight, which featured other notable graphic novelists like Ben Hatke and Raina Telgemeir. At only 21, Larson published her first graphic novel, Salamander Dream. Sketched simply, with dark, bold lines and muted, sage greens, the book teaches readers to recognize the leaves of the American chestnut, the drumming call of the grouse, and other markers of the natural world while telling a riveting fantasy story. Larson’s style has stayed in this vein, conveying emotion and meaning through detail and coloring that never overwhelms the reader with sensory information. She does much of the work on an iPad Pro, which allows her to zoom in and move elements easily. When the sketch is complete, she prints it and uses light pencil, then inks over the page. At that point, she turns it over to her publisher to finish the coloring. Writing for younger generations has another perk: getting kids interested in reading. “Over the years, I’ve seen how important comics can be for kids who are reluctant readers or who learn differently,” she says. “This form is a way to understand stories visually, by seeing what characters are feeling. It makes me feel like I’m doing something worthwhile.” It’s a sentiment that has been echoed by Larson’s fans, particularly in regards to her adaptation of A Wrinkle in Time. Larson occasionally takes a break from drawing and lets someone else take over, as is the case with Batgirl and her Four Points series, about two preteen twin adventurers on the hunt for treasure. But she’s returned to illustration in her newest work, All Summer Long, a middle-grade story featuring a main character, Bina, who wants to start a band while navigating a rocky friendship. She’ll be working on two sequels in the coming years. While there may be more to do in Asheville than there was 20 years ago, it’s still calmer than Los Angeles and Larson is settling in nicely. “I loved L.A., but that wasn’t how I wanted life to go for the next 10 years. I wanted to work on more passion projects and put all of my energy into whatever I’m working on.” And so far, it’s going as planned. “I’m pretty happy to be doing my own thing for a while,” she says with a smile.